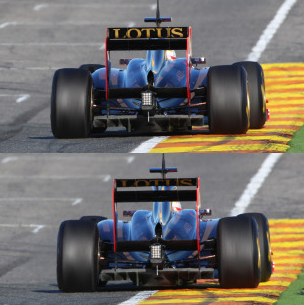 DRS is an overtaking aid altering the angle (opening) of the rear wing flap to reduce aerodynamic drag. Use of DRS during the race is conditional. DRS can only be activated after the first two racing laps in the designated zones. Drivers may also use DRS when they are within one second of the car in front and when both cars cross detection point. Dependent on race conditions, the race director can suspend its use. The FIA estimate the speed increase to be between 10–12 km/h when DRS is in use. DRS is disabled when the rear wing flap is in its original position (closed). This happens when the driver uses the breaks after activation. When the flap is closed it creates more downforce giving better cornering. This entry was posted in Motor Sport, Tech Corner and tagged aerodynamics, drag, Drag Reduction System, DRS, F1, Formula 1, Motor Sport, Technical, wing flap on June 9, 2013 by karenunchained.